Get your oven ready by preheating the oven to 180°C. Grease and line 2 x 20cm/8in sandwich tins – try using a bit of baking paper to rub the butter around. Crack your eggs into a large mixing bowl, pop in the sugar, flour, baking powder and baking spread. Mix everything together until well combined with an electric hand mixer or wooden spoon. Be careful not to over mix too much. Once it’s done the mixture should fall off a spoon easily. Pop them in the oven and bake for 25 minutes. Check after around 20 to make sure they’re not cooking too fast. You’ll be able to tell when they’ve done, because they’ll be golden-brown and coming off the edges of the tins. Press them gently to check – they should be springy to the touch. Once they’re done, take them out of the oven and leave aside to cool. Should be 5-10 minutes. To take them out of the tins, we recommend running a butter knife around the edge then carefully turning them out onto a cooling rack, leave them there to cool completely. 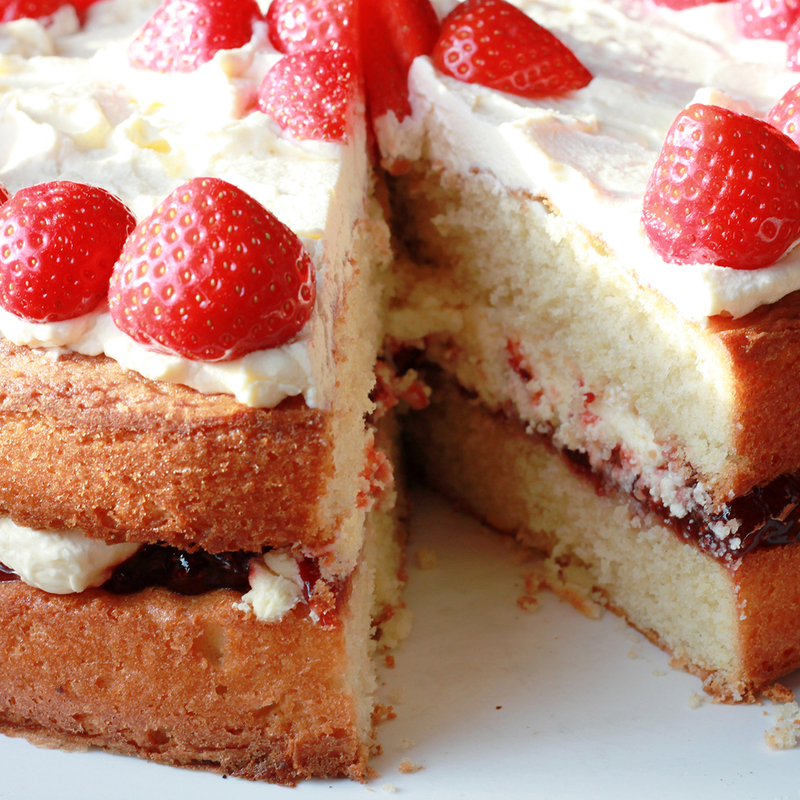 To build the actual cake, place one cake upside down onto a plate and spread it with plenty of jam. You can also spread over whipped cream too! Top with the second cake, top-side up. Sprinkle over the caster sugar and enjoy!